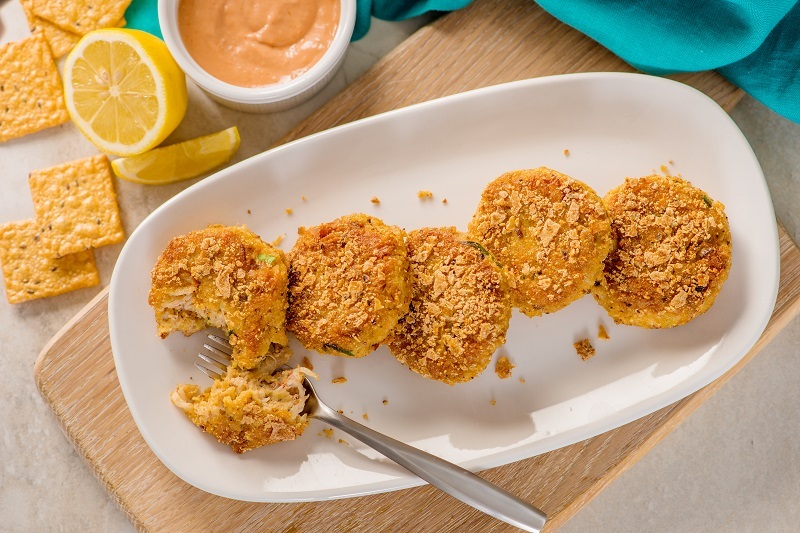 Combine crabmeat with ¼ cup Crunchmaster® Sea Salt Multi-Grain Salt Cracker crumbs, eggs, green onions, ¼ cup mayonnaise, lemon juice, 4 or 5 dashes of hot sauce, salt and pepper, mix well. Pour remaining cracker crumbs into a dinner plate or shallow bowl. Shape crab mixture into 12 cakes using ¼ cup mixture for each cake. Coat the crab cakes with cracker crumbs, lightly pressing the crumbs into the cakes. Place crab cakes on a plate, cover with plastic wrap and refrigerate for at least 30 minutes or up to 4 hours. Heat oil and butter in a large skillet over medium heat until butter is melted. Cook the crab cakes in batches (do not overcrowd the pan) for 3 – 4 minutes per side or until golden brown on the bottom. Whisk together the remaining ¼ cup mayonnaise with the cocktail sauce and 3 or 4 dashes of hot sauce. Serve the crab cakes with the creamy cocktail sauce and lemon wedges.